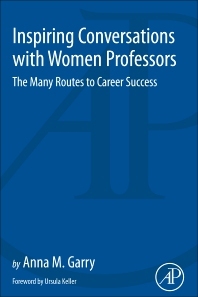 Inspiring Conversations with Women Professors: The Many Routes to Career Success provides stories behind the many paths to professorship taken by these featured women. It includes information on their diverse life stories and how they navigated the beginning, middle stages, and other parts of their careers, including unexpected paths, support and how they got hooked by science/their field. In addition, they discuss why they chose this career, the obstacles they encountered, and how they found a way forward. Each interview encapsulates the advice and practical solutions they give. Anna Garry has a BSc, a PhD in Political Science, a Diploma in Adult Education teaching and a Masters in Creative Writing. In her thirty year career in higher education she has worked in a number of fields: innovative science education research projects; creative writing teaching and editorial work; science outreach projects; and research initiatives and skills training in the area of gender equality in science. From this experience she has written three book chapters and four handbooks on aspects of educational practice in higher education. Whilst working in the field of creative writing she sat on the boards of literary journals such Pretext, Reactions and she edited five writing collections. Recent highlights are the “Reflections in Diversity” Column from Optics & Photonics News (OPN) and the scientific outreach book, “A Journey into time in Powers of Ten,” Anna Garry and Thomas Feurer (editors), ETH publishers, 2016. Since 2010 she has worked as Outreach Officer for a Swiss-funded physics and chemistry research network NCCR MUST (National Center for Competence in Research Molecular Ultrafast Science and Technology) where she is responsible for the equal opportunities program and educational outreach projects.